Currently, I am in second place in our little crew of 7 with 46.43 miles. There are a lot of days to go, but I have to get out there and run the miles. According to the spread sheet that my friend created, I have to run 2.756 miles per day from this point forward to hit my goal. Now, I am already registered for 2 Full marathons and 2 Half marathons, but that is only 78.6 miles out of 1,000. To achieve my goal, I am going to need to be consistent in my running. 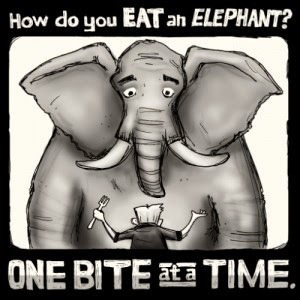 Like they say about eating an elephant (of which I have no desire), it has to be done one bite at a time. Isn’t that how it is in life? We have huge dreams and big goals, but we forget that it takes many steps to get there. Some of those steps may be big ones, but some of them might be tiny. Unrealistic expectations can destroy those of us serving in ministry. We want change in our church, ourselves, and others, but forget that it takes steps to get us to that point. I think about my own challenges with weight. I reached 260lbs over a lifetime of poor eating choices and limited activity. One workout or one healthy meal wasn’t going to change me into the model of fitness. However, weeks and months of eating the right things and moving more did change me. Take up a big challenge this year, but don’t forget that it takes a lot of little steps to reach your goal.